Ingredients headed for the chop shop! When I started learning to cook, I found that I really enjoyed the process. 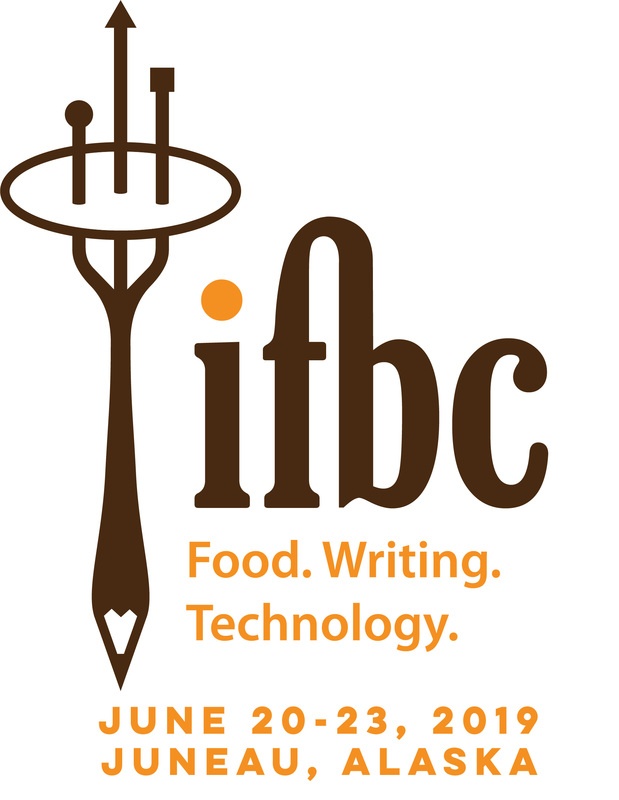 I especially enjoy chopping- so I spent a lot of time serving as a prep or sous chef for those willing to show me a thing or two in the kitchen. There’s something zen about taking vegetables or pieces of meat that are all different sizes and getting them to uniformity. I haven’t taken this enjoyment as far as Julie Powell, but when I get to chop for a while, I’m a happy gal. So recently when the mercury started to fall here in NorCal, I found myself in the produce aisle eyeing root vegetables and Brussels sprouts and planing a housewarming chopping party. Not entirely uniform, but ready for seasoning! 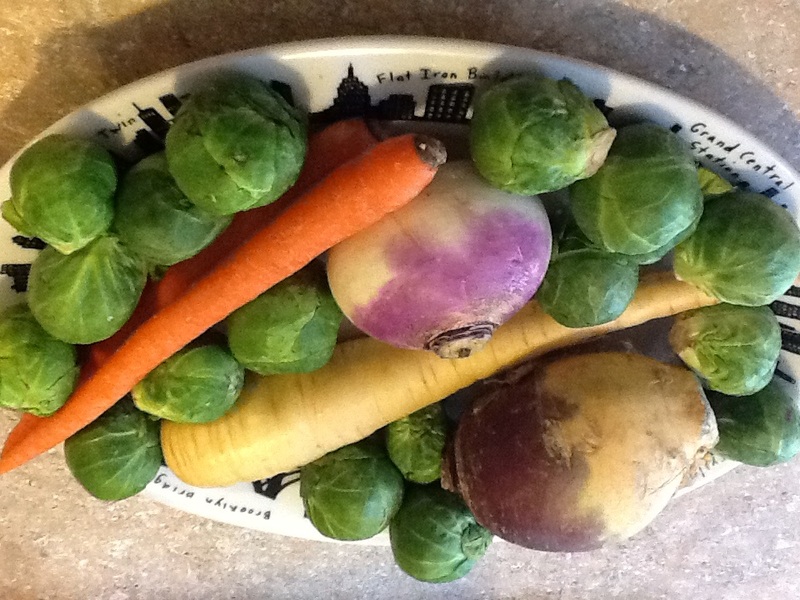 I toted my turnip, rutabaga, parsnip and sprouts home and dug some carrots out of the crisper. I cranked the oven up to 400 degrees and got to chopping. The sound of the knife on the cutting board became my rhythm section as I hummed along to some happy tune. 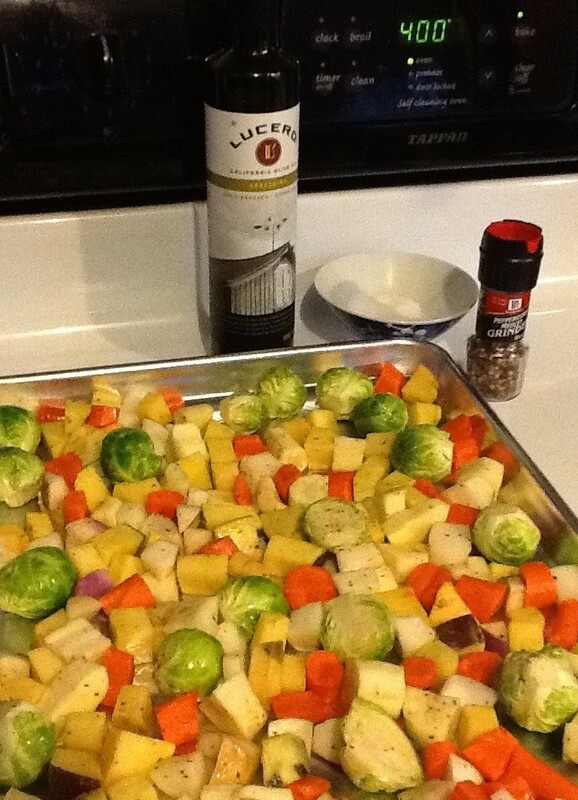 But finally, the veggies were chopped, scraped into a bowl, tossed with Lucero’s Arbequina olive oil, kosher salt and pepper then spread out onto a baking pan ready to roast. My beauties went into the oven for about an hour and 20 minutes total, with a couple of tosses in between. My home was filled with warmth from the oven and the toasty smell of roasting vegetables. When I couldn’t take it any longer, I pulled them out and gave them one more toss in their original bowl for another coat of evoo and salt. Voila! Chopped and roasted heaven on a housewarmed platter! 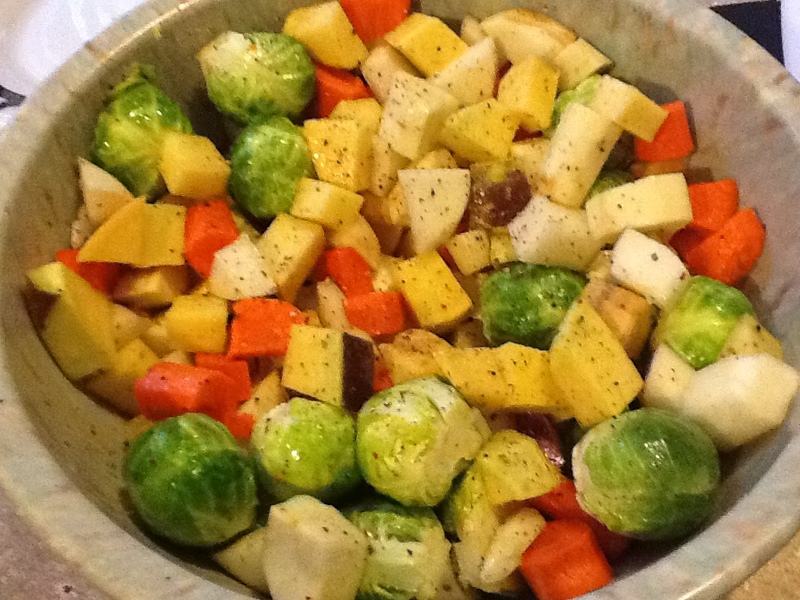 I ate some of my roasted root vegetables right away and saved others to go with my lunch later in the week. I’m going to a day-after Thanksgiving potluck, so I’m planning to make another batch next week. So simple and delicious! 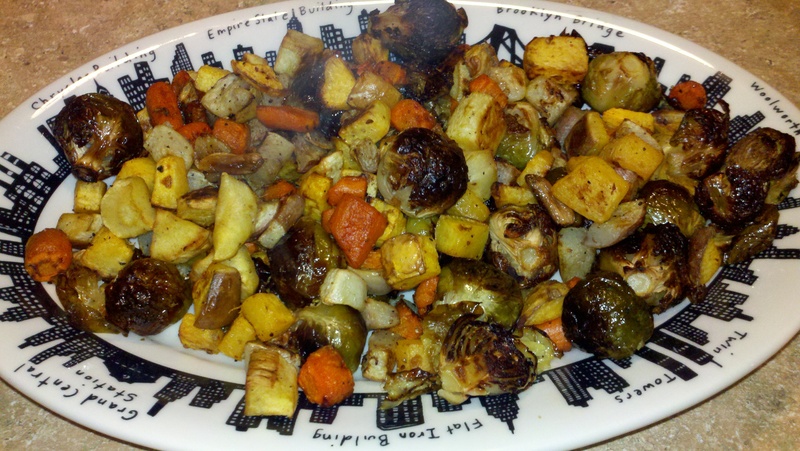 What are your favorite roasted vegetables? Hot out of the oven. Can you see the steam?